~* West End Designs Journal *~: The Never Ending Scarf Project! The Never Ending Scarf Project! Today I had hoped to share a picture of my latest "work in progress", but it is overcast and just about ready to rain any second. Oh look, it is pouring out now. So I will just tell you about it and take the picture later, because frankly, I am going to be working on this a LONG time. Sometimes when I knit, I crave easy. As in "garter stitch" or the good ol' basic knit. Whatever you call it, it is squishy and soothing. Recently I ordered some Cascade 220 Superwash for Jimmy Bean's Wool. (Just an aside here. If you knit and need yarn, I highly recommend them. The shipping is like lightening.) My goal was the DAUNTING Dr. Who Scarf. I love Dr. Who, always have. Even the new Doctor from this season is growing on me. 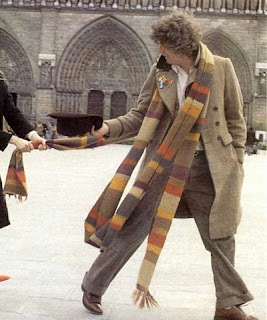 Anyway, the scarf is from the older, campy, before special effects got good, version. Basically, it is just a striped scarf. I envision this striped squishy goodness wrapped around my neck with a multitude of Fall jackets. There are some bad things about this project however. The original is OVER TEN FEET LONG. UM, yes, that is not a typo. A super long scarf plus me equal a trip to the ER in which the doctor has to leave the room because he cannot stop laughing over the fact I tripped on my scarf! Secondly, the colors. Yellow, no thank you. So I have made a few modifications. Shorter and in a more pleasing Fall palette. I am really pleased with the color palette I chose (which I will get a picture of soon!) and hopefully it will be done by the Fall. Of 2010 that is!!! 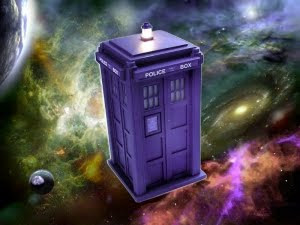 For those of you who have NO CLUE about Dr. Who, here is the LINK to the official site. And if you have Netflix, you can watch the old episodes for free!! !